The visiting Chinese gold medalists displayed their superb sports skills again in Hong Kong on Saturday morning, whose performance impressed over 5,000 Hong Kong spectators face to face as well as tens of thousands of viewers through TV live broadcasts. The enthusiasm for the Olympic Games was rekindled in Hong Kong as Chinese mainland's Olympic gold medalists on Saturday made their appearances and met the public. 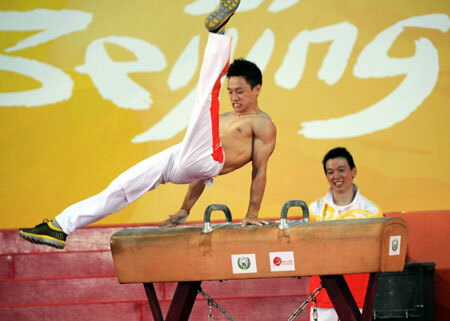 As part of their visit to Hong Kong, the delegation of Chinese mainland's Olympic gold medalists put on demonstrations of table tennis, badminton, diving and gymnastics. More than 5,000 people watched their performance at the four venues of the Leisure and Cultural Services Department of Hong Kong government, while tens of thousands of viewers watched the TV live broadcasts at home or elsewhere. The gold medalists also had exchanges with young Hong Kong athletes. Some of the participants, selected by drawing lots, took part in the sports-for-fun sessions with the medalists in table tennis, badminton and gymnastics. China's Olympic gold medalists arrived in Hong Kong on Friday, kicking off their three-day visit to the city. "I hope the Hong Kong public can use this opportunity to share the joy and pride of their country," Hong Kong Special Administrative Region's Chief Executive Donald Tsang said. The delegation, including 63 gold medalists from the Beijing Olympic Games, took part in the flag-raising ceremony at the Golden Bauhinia Square on Saturday morning. After the sports demonstration, the delegation met the public at a Gala Show at the Hong Kong Stadium on Saturday afternoon. The delegation will leave for Macao on Sunday afternoon after visiting Disneyland and the Ocean Park, two of Hong Kong's famous theme parks.